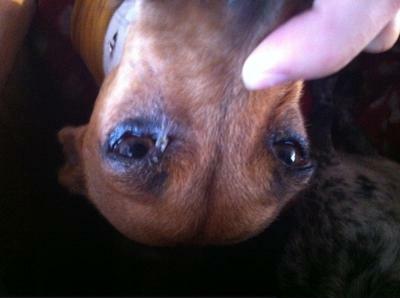 My Jack Russell has swollen eyelids since 10 days ago. I noticed her left top eyelid swollen and red inside and the right looked like it was starting. The next day I took her to the vet who could not identify the type of infection. He prescribed broad spectrum oral antibiotics and said if it worsens over 3 days I should bring her back. It did, so I took her to the vet who then sedated her to examine her eyes. He also could not conclude her diagnosis. He said that the next step is a biopsy and referral to a veterinary ophthalmologist if she does not respond to treatment (antibacterial eye drops). 5 days later and her eyelids still look the same, though there is no longer pus coming from the eyes. Any idea what this could be? Both eyelids are now equally red and swollen. I’m afraid I can’t determine what might be going on with your dog based on your picture and description. You didn’t mention whether or not your veterinarian ran any tests on your dog’s eyes. If she were my patient, I would perform a corneal stain to look for any scratches or ulcers on her eyes, a Schirmer tear test to determine if she was producing a normal amount of tears, and check her eye pressure to rule out glaucoma and/or infections within the eye. If all of those tests came back normal and she did not respond to symptomatic therapy (e.g., the eye drops you mentioned), referral to a veterinary ophthalmologist is certainly a reasonable next step. Join in and write your own page! It's easy to do. How? Simply click here to return to Eye Infection.